It is a bit unusual for rains to strike Mumbai in the beginning of November but what surprised me more was the rumbling of clouds. I wasn’t sure when I had dozed off yesterday in a mostly sleepless night only to be woken up by what I had thought was a low flying jet. But the sight of rain lashing the trees lustily in the morning cast a doubt about my earlier perception. After that noise, I had weltered in the accumulated odour of sweat and recent unsavoury events before slipping into a slumber. I never knew when the rain sneaked upon the city. It had been a long, torrid week with several rattling developments. Early on Monday, I was summoned by the bosses of Sterling Fincom who put me to task for the losses my unit was making. He said it reflected poorly on my leadership and the team and was going to have ‘consequences’ after they took over. The very next day our own Senior Vice President asked me to hold back fifty percent of the salaries of the staff till December to gloss over the losses. Then Mrs Joshi ended up with a complicated fracture and the area manager refused to provide a substitute for her. One day in the midweek I lost my expensive Apple phone to some pickpocket, barely two months after I had bought it, and I had to keep banging my head with the police and the customer support of the telecom company just to register the case. I had been long seething against the greedy team of auditors whose binge eating sessions were being borne by our branch, but the thin fuse holding it back gave way eventually and I told them to go ahead and fornicate with each other if they wished to but I wasn’t going to buy even a glass of slosh for them. They promptly launched a guerrilla war against me in reprisal. Worse was to follow on Thursday: I slapped the cheeky representative of Sterling Fincom for sidling up to Kanika, and had him thrown out of the premises by the over-willing armed guard, only to be berated by Kanika for being unduly virulent. As it happened, I might have scored small victories here and there, but in the process I had more than shot at my own foot —I had it sawed and thrown away in a gutter. No way in this eternity I could dream of being a future employee of Serling Fincom. Nor could Kanika. Sometime in the midweek on an eerily quiet evening, I mooted to Kanika the idea of joining coaching classes as instructors. I used to be rather popular among the students when I was taking classes of reasoning ability and reading comprehension at Radiance, a multi-stream coaching centre run by Jatin at Dadar. It had been four years since I quit, but I hadn’t let the link cool off. We shared a few hobbies, I and Jatin, and we met many times over mugs of draught beer, or to watch one-day cricket at Wankhede stadium later on. We liked the same authors and books, albeit for different reasons, and we could haggle endlessly over the characters and plots of Robin Cook, Jeffrey Archer, Ken Folet and Frederick Forsyth. We loved and hated mostly the same players in the cricket team. Given that, I was sure I could resume at the coaching centre any day I wanted, and Kanika too had an excellent chance, what with her flair for mathematics and other science subjects, except that the remuneration would be about half of what we were getting currently, or even less. I briefed up Kanika about Jatin who belonged to a rich family of businessmen from Gujrat and how his folks had set up the coaching institute just to stop him from migrating to Australia. Nestled in an alley across the road from the Portuguese Church at Dadar, Radiance had about 350 to 400 students aspiring for breaking into banks, insurance companies, management institutes and engineering colleges. However, its correspondence courses were the real money spinners providing a major chunk of the income. Even if the business was nowhere close to Jatin’s calling —he would be happier touring the world in a hot air balloon—it certainly kept him busy, and he was smart enough to keep the courseware updated and refreshed. He had an innate knack of homing in on right people for his team, and not for once I had known him to fail in his judgements about a person. For the next two days, we kept discussing ending our factious existence as finance executives and turning into torchbearers to career aspirants. We had graduated to launching our own coaching classes by Thursday evening. Since we didn’t have the required initial capital, we planned to join as instructors somewhere to familiarise us with the latest trends, and also to prime us for the eventual launch of our own ‘academy’. And then, maybe, I told myself secretly, it will bring us closer and we might even start living together. The ominous figure of her unknown husband did spring like a late afternoon shadow on my conscience now and then, but I shooed it away frantically, allowing myself a harmless, temporary elation. Why not? I questioned myself. For once, I must learn to live in the present. Nearly all adults one knew were married, weren’t they, and did that mean we could have no more relationships? We were humans, not angels. On Friday, Kanika reported late at the office and she brought her daughter Kia along. She seemed flustered and appeared to have cried. She put Kia temporarily in Mrs Joshi’s unoccupied corner, instructing her not to touch anything in there. The little girl sat motionless in the chair, trying to compose herself, and not to return anyone’s smiles. Since Kanika seemed wound-up and peevish, folks talked to Kia instead, giving her mother the space she needed. Kia conversed only by shaking her head in yes or no, and it was mostly no, until I happened to be pass by and ask her if she would like to have some orange juice and she nodded emphatically in yes. That was how Kia and I ended up in my cabin, both lovers of the citrus fruit, with glasses of orange set in front of us. “Is everything OK, Kanika?” I asked her. The corners of her eyes were bloodshot still. “Kanika, I am deeply sorry for yesterday.” I had been mulling over my violent reaction and had it finally out of my gut. Perhaps Mr Sengar’s touching her wrongly was unintentional after all, even if it happened twice. There is only so much space in her cubicle. Her desk was crammed to the gills with files and had twin terminals to boot. She had stomped out to the toilet in a rage just as I moved in to give the representative of Sterling Fincom a taste of my boxing skills. We stayed till nine in the office that evening, sifting and sorting out the cuds of our planned venture. We dreamt and agonised over imaginary figures of students and batches and postal dispatches. We bickered lightly on incomes and expenditures, rents and bills and salaries to be paid to supporting personnel. We figured it was best if we moved further north into the suburbs, into the upcoming areas like Mira Road where both competition and rents would be low. We planned to target students from the lower-middle income bracket whose families would be willing to pay less but that could be compensated by higher number of batches. It was not till Kia couldn’t play ‘Duck Duck Moose’ anymore on Kanika’s mobile for the battery draining out, I had forgotten we had a little girl in the office too. When I asked Kanika what she would prefer for dinner, she said she would be fine with mostly vegetarian food as long as it was not in a bar. I felt ashamed for not having asked her out before. I must have been blind, deaf and outright dumb. Or worse, just callous. But then Kanika had possibly accepted my offer because she didn’t need to worry about picking up Kia from the creche. I didn’t know what terms were imposed upon her as a paying guest. All I had managed to gather from her till date was she shared the accommodation with a girl from Shillong, working at Taj Land’s End. I guided the auto rickshaw into the narrow lane off the Hill Road to Birdsong Café. Kia was delighted to see so many light bulbs hanging asymmetrically from the ceiling. Her sleepy eyes opened wide when she saw the menu scribbled on a black wall behind the counter top. “Is this a school?” She chirped. “They teach you to eat, drink and be merry here,” I picked her up in my lap so that she could have a better view of the ‘blackboard’. We were guided to a round table against the far wall by a young barista. A high-fidelity music system was playing a catchy number. As we settled in our chairs, I turned to look at the spectacle of folks around other tables, their faces flush with happiness, as if they existed in an alternate time-space. If they had problems hogging their personal lives, they were certainly well concealed or forgotten for the moment. Here they were merely talkers and listeners, and some of them were avid eaters intent on their plates. My eyes locked with a few men and I wondered if they could picture my existential angst. With my current employer folding up wings in a matter of weeks, I was about to join the ranks of the jobless, if not the shanty-dwellers. While Jatin would be happy to have me back as an instructor, he was an atrocious paymaster. Somehow the hopes of launching a coaching enterprise seemed artificial in the quaint incandescence of the café. And I had the temerity to include Kanika too on a kayak without oars. A tad belatedly, I realised those gentlemen were keen on eyeing Kanika rather than me. Apparently, she was quiet a head-turner. A smile cracked my lips as I thought of Jatin who had a thing for beautiful women. I was certain he was going to turn to jelly the moment he sets his eyes on Kanika. But the realisation brought a chilling thought too that sank to the seams of my heart. Here were we, siting together like we were destined to be a pair for ever. Who knows what will happen when I introduce her to Jatin. Perhaps he will offer her a position but turn me down regretfully. He was a past master of preying on insecurities of others. I remembered all those queries I had on my mind about Kanika’s personal life but it hardly seemed to be the place to fire up unpleasant conversation. She appeared quite relaxed with a mild smile on her lips, and serenity rolled in her eyes. She was clearly enjoying the music and the ambience of the café. “And what could be your favourite food?” I asked her. “Given a choice, I’d go for pasta,” she said. He went to the counter and had a long discussion with the goateed chap behind the cash register, who fished out the jacket of the CD from somewhere below. Together they pored over it owlishly before the goateed man scribbled something on a piece of paper. The barista rushed back to Kanika like a child who had caught a living butterfly. He beamed as he offered the piece of paper to her with a deeper bow, as if it were a rose. “’Bell Bottomed Tear’ by The Beautiful South.” She read it for me. Since the number had long since ended and Lionel Ritchie had taken over, I asked him to put that back again on the player. As it turned out, they played it not less than four times before we left. But Kanika had turned her focus to Kia who was refusing to eat anything other than hot chocolate. She was told firmly she wasn’t getting any of it till she ate a bit of pasta and chicken rice too. “Ugly, Oily, Pasta!” Kia waved a finger at her. We both giggled. I hired a taxi to have Kanika and Kia dropped at their housing society at Dadar, which I realised was not too far off from the Portuguese church where Jatin had his establishment. After they disembarked, the taxi retraced its way back to Bandra. As it plied past Mahim Creek, its fetid reek covered me like a blanket that refused to lift even when I crumbled in my cold bed. The alarm had dutifully kept mum for the Sunday and now the arms of the clock were pushing beyond half past nine. We had planned to catch the 09:59 fast local for Virar and now it was impossible to do that. I was about to call Kanika and apologise for the delay when my new Galaxy phone started ringing. I was yet to adjust to its ringtones but it was like a secret bond between me and Kanika —it was the same model as hers I had chosen after I had lost my phone. She couldn’t come to office on Saturday because she needed to find a proper creche for Kia. Instead of touching even one paper piling my desk, I had carefully called up the real estate brokers up north and fixed up appointments with three of them for Sunday. I picked up the phone and found it was Kanika herself calling in to tell me she’d be delayed by an hour. Greatly relieved by the news and happy to be hearing her voice, I began telling her how I too had overslept, but she had switched off already. Since it was still drizzling half an hour later, I ditched my Hush Puppies in favour of a pair of Nike sneakers and hopped into a taxi for Bandra station. I was quick to notice Kanika from the foot overbridge leading to the fast track platform. She appeared to be having an argument with a thickset man who raised his hand to slap her at one point but seemed to change his mind. He stamped his foot and yelled at her before he turned and lunged dangerously into a Churchgate bound train that had gathered much speed. By the time I could scramble down the stairs the train was gone and so was he, much to my surprise. Considering the wetness of the platform, it was a miracle he had managed to hurl himself right into the door of the speeding carriage. I rushed to Kanika who was still recovering from the shock. “Who the hell was that, Kanika?” I begged of her. “Just a drunkard!” she whispered hoarsly. “Just a drunkard—? Mumbai is surely going to dogs!” My voice was drowned by the blaring whistle of the Virar local closing in on the other platform. Someone was trying to dash across the tracks but wasn’t smart enough to clamber over or turn back. Soon the PA system was summoning the on-duty accident hamals to report at platform number five. I am happy to have retained your interest, Derrick. If I had known there is going to be a third part, I would have waited. I read both the parts at one go and now my curiosity is killing me. I am sorry to have left you dangling but the word count was exceeding 6000, a bit long for a blog post. Thanks for reading. When it is written in such an arresting way, I don;t count the words, Waiting….. Many thanks for the pat on the back. As usual, totally engrossed while reading but the best part is that we will see the climax on 3rd feb. I have tried to retain the interest of my patrons by setting a date. Many thanks, Abhai. Thanks goodness I have guessed what will happen – otherwise I would not sleep well until after Feb 3. (Apart from the fact that I like your new website look) this is as captivating as ever. It’s the tiny details that makes it so real and believable. Uma’s style is unquestionably Uma’s! Fortunately for me, I have already written the end fearing telepathic extraterrestrial intervention! Thanks for the feedback on the new theme, although I would like to change certain attributes here and there. I suspect a Deus ex machina will be required! Realism can be very limiting – especially if we stick to reality! Oh you mustn’t rewrite! Just leave it with Adonis and Penelope descending in a cloud from heaven and saving everyone – the way I am expecting!! Well, there is no harm in Adonis and Penelope riding the clouds till they are electrocuted at the appointed hour. You’d never be so cruel! Surely? Part 2 too ends at the right moment to keep us waiting to hear what happens next. Of course now there is a promise when the next part will come. The universal character of an auditor and the usual action of their victims to please them at any cost will ring a chord with many. The tale continues to be gripping. It’s great to learn the story has retained your attention despite the protracted interval. Thank you so much for the feedback, it will keep me charged. Eagerly waiting for the last part !is it going to be the last or will there be more ? Tomorrow is a difficult bird. It is there and then it isn’t. Enjoy the music while it lasts! Uma Shankar, intriguing! And a child character! And a description of Mumbai! Wow! I had a chuckle at “his folks had set up the coaching institute just to stop him from migrating to Australia.” Next part awaited! Shubha, I did think of the folks who have migrated to Australia when I scribbled that. Thanks for the encouragement. Gripping! Now waiting for part three. Thanks for stopping by, Subroto. First, I really like the new site look! Your photo is stunning…quite professional and I especially like the flowers showing in the wine glass. Wonderful composition, Uma. The story is another page turner…will they live happily together as a family and with a successful business venture? or is he destined for a broken heart or a numbed sense of life…we shall see. Looking forward to Feb. 3rd! Thanks for the feedback on the new site look; one needs to keep up with the trends. I need to apologise for not crediting the photo I used for the post —it’s not mine, but I believe it to be free for use and I plan to replace it with an alternate image. I am encouraged to find your interest intact in the story. Although the last lines have already been typed in, I may have a change of heart! An intriguing part two Uma, I suspect that not all is as it seems and our narrator will have some shocks in store! To be sure, there is a fire somewhere for all that smoke. I hope not to disappoint the finer sensibilities with primitive artefacts I churn. Many thanks, Andrea. Can’t wait to know what happened next and how the story ends. 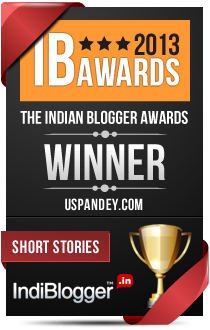 Thanks, Divya, for the many detours you take to my blog. I read part one again. And when part three is here, I will probably start from the beginning, one more time. 🙂 It’s such a pleasure. I am fortunate to have your readership, Divya. There is a certain advantage in reading the whole story in one go, assuming it’s been written well all through. I have tried to downscale it to suit blogging format. the reader awaits the 3rd part. Thanks for the effusive praise, Rajni ji. I’ve been trying to be a good storyteller. you are an excellent one and that is what all your readers have always been telling you. Good morning and have a good day. I can’t begin to decide where this story might lead us, Uma. There are many possibilities. And most of them, so far as I can see, are not happy endings. I await the final instalment! I shall need to reach the end before I reach a conclusion on that! I appreciate your premise, Sandra! I will await the light of your fine vision. Details! Oh, the details! They give the story such a multilayered feel. In just a few words and sentences, you can conjure up a world. In fact, this was something that had struck me for the concluding part too. Jatin’s character is fleshed out so well, and not in one go. I loved getting the the little bits here and there. Alluding to emotions through imagery is done so well. There is foreshadowing, rather a warning of what is going to happen when Kanika is introduced to Jatin. And this part was most intriguing in the conclusion. Having read the concluding part first of all, I must say that coming back to read how it all came about is Very satisfying. You have read it with the benefit of hindsight, and that can be a great thing! I appreciate that you noticed the gradual build up of Jatin’s character. For me, it is important that it doesn’t feel rushed. He is an important catalyst in the denouement of the story. I am grateful for the extensive overview, and the cherish-worthy compliments. Nothing in the story feels rushed. Everything builds up very well and in fact that is one of the best parts of the story. The peeling off the layers from characters and their subconscious. The pleasure is mine. You have nourished my confidence deeply, my friend. Thanks a kiloton! The plot thickens. Fascinating writing as usual. Leads the reader on to the third part effortlessly. Thanks for the feedback, Karthik. I am glad to have fared well so far.